We are still working on fully supporting College Football, but wanted to get this in everyone's hands asap. 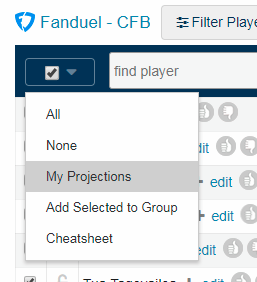 While this is in beta, some features will be missing, most notably: 1. stats, so clicking on players names will not work and; 2. we do not have a projection algorithm setup yet, so you will need to upload your own projections until we get that added. Good news, CFB will be free of charge until it is a finished product. Thanks for your patience and please send any feedback to support@fantaycruncher.com. Because of the number of players in College Football, here are a couple of tips to help make sure FC is performing correctly this weekend, if you are uploading your own projections. Make sure you set the paging to 100 or under. If you are displaying ALL players, you are going to have a bad time. As always, there is a link at the bottom of this alert message that will dismiss this message, and you won't see it again. Just click where it says: "Dismiss (Do not show again). Thanks and GL this weekend!